The team announced this decision yesterday, which included promoting Johnson to President of Basketball Operations, firing GM Mitch Kupchak, and reassigning Jim Buss from his previous role of executive vice president of basketball operations. The move is not entirely surprising; Magic recently said in an interview that he wanted to “call the shots” in the organization and his hiring as an adviser to the owner seemed to suggest that this day was coming. However, the timing of the decision was bizarre, as Johnson was assigned to his new, all-powerful post just two days before the NBA’s trade deadline; this is a time when most front offices would need as much stability as possible to make important decisions in a team’s future. Instead, the Lakers went in the opposite direction and hired Johnson, a franchise legend who, with this most recent assignment, has now played, coached, owned a stake in, and made basketball decisions for the Lakers. No matter what you think of this hire, that feat is awfully impressive. However, the decision to put an inexperienced legend in charge of basketball decisions needs to be seriously questioned. I love Okafor because he’s won a state championship in HS, NCAA Title at Duke and he can bring that championship pedigree to the Lakers. The Dallas Mavericks’ trade for Rajon Rondo puts them in position to be a contender in the Western Conference. The Bucks just acquired the next Jason Kidd in Michael Carter-Williams. The only way San Antonio or Miami don’t win the championship is if neither team makes the finals. Finally, a prediction Magic was right about! To be fair to Magic, though, saying bizarre and incorrect things on Twitter does not necessarily translate to failure as a front office executive. It just means that, well, his evaluation skills might need some work. That is not the end of the world; for example, the Celtics hired Danny Ainge as President of Basketball Operations in 2003; while he has not been perfect in this role, he currently has the Celtics as one of the best teams in the East and may have casually finessed his way to the #1 pick in this year’s draft. Ainge’s is the blueprint Johnson must follow in his new role. One would figure that even as he assumes the power of his new role, Johnson would attempt to surround himself with experienced/skilled executives who have been around front offices and can provide a different perspective. If his first hire as President of Basketball Operations is any indication, however, Magic probably isn’t doing that. In a move that broke yesterday, the Lakers are expected to hire well-renowned agent and Rob Lowe look-alike Rob Pelinka as their new GM. Pelinka also has zero front office experience and, perhaps most significantly, was Kobe Bryant’s agent throughout much of his career; he was also widely regarded as the sixth member of Michigan’s early 90s Fab Five, as he was a reserve guard on the Wolverine team that went to back-to-back national championship games in 1992 and 1993. Pelinka’s hiring begs this question, though: if Johnson and Pelinka are heading the Lakers front office, how long is it until Kobe Bryant gets involved in the Lakers’ dealings? It is merely speculation at this point, but one would logically think that the Black Mamba would have some type of advisory role in the front office sooner or later, even if it is not an official role. Also: what kind of responsibilities will Johnson and Pelinka have? One would think that Pelinka would be tasked with more of the day-to-day decision-making and cap expertise. After all, Magic admitted that he does not have a full understanding of the collective bargaining agreement (which, in some cases, is a prerequisite to holding a job like Magic’s) and that is why he hired someone like Pelinka as General Manager. Johnson would likely be more of a figurehead who has final say over roster decisions, the coaching staff, etc. We’ll see how the power shakes out, but the Lakers have now placed two complete neophytes in substantial front office roles. It will be interesting to see what results of this and who else is hired into LA’s front office. Johnson also takes over the Lakers at a critical time for the franchise. The team is in its first season with new head coach Luke Walton and most agree that he is the right man to coach the team going forward. The organization has had three top ten draft picks in as many drafts and has converted those picks into Julius Randle, D’Angelo Russell, and Brandon Ingram. All three have been solid, competent players, but none looks like a superstar yet (Ingram likely has the highest potential of achieving stardom and also has the longest way to go to fully develop). This is going to be Johnson’s job in this draft. The Lakers’ first-round pick is top-three protected this year; if it falls outside of the top three, it goes to the Philadelphia 76ers. The Lakers currently possess the third-worst record in the league and may or may not be tanking to improve their chances at a top pick in the lottery. In such a talented and deep draft, though, having a top-three pick will be enormous for the future of the Lakers. Converting that pick into a superstar is what Johnson must do if the Lakers want to improve their standing in the West. Even though the new regime only took hold yesterday, the Lakers are already hard at work; hours after the shakeup, the team traded guard Lou Williams to the Rockets for Corey Brewer and Houston’s first-round draft pick, which will likely fall near the end of the first round. This seems like a logical trade, but Magic could have squeezed more out of the Rockets if he wanted to; Williams ranks eighth in the league in points per 36 minutes among eligible players and Houston likely would have surrendered more if the Lakers asked for it. This subtraction will hurt the Lakers in the interim, which probably is not an accident. 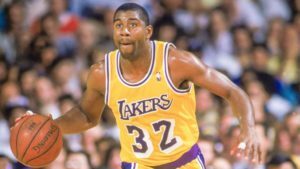 Magic Johnson is taking over the Lakers at a pivotal time for the franchise. The team must convert their draft pick into a star in this draft and build an organization capable of attracting star free agents in future years. The Lakers are rolling the dice in tasking him with basketball decisions, and the last time a former player and coach was hired to an executive basketball position he had no prior experience in, it didn’t go so well. I’ll just leave that right there. But, we must keep an open mind with the hiring of Magic Johnson. After all, the fact that it’s an enormous risk doesn’t mean that there won’t be an enormous payoff down the road. The NBA season has reached the All-Star break and there are several interesting storylines. The Warriors, replete with superstar Kevin Durant and many others, have emerged as the best team in the league, Russell Westbrook is having a season for the ages, and the Cavaliers have endured a difficult, injury-plagued season in their championship defense. With the league at the All-Star break, now is as good a time as any to assess the state of affairs in the game and share some thoughts on players and teams. Here are five of my observations on the first half of the season. If I were to tell you about a European, second-year big man who is a good passer, rebounder, and three-point shooter, your mind would immediately gravitate toward Knicks forward Kristaps Porzingis. Actually, I’ve got something (or someone) even better for you. At the beginning of this season, Nikola Jokic was not even starting in a crowded backcourt for the Denver Nuggets. However, after Jusuf Nurkic was benched in mid-December, Jokic has emerged as one of the best big men in the game, averaging just over 20 points and 10 rebounds since assuming his starting role. More recently, he dropped 40 points on the Knicks and put down a triple-double in a 22-point win against the Warriors. In the box plus/minus statistic, a metric used to evaluate a player’s contribution to his team, Jokic ranks fourth in the league behind Chris Paul, James Harden, and Russell Westbrook. Not too shabby. Sadly, many won’t be able to appreciate Jokic’s contributions unless the Nuggets make the playoffs. Denver is currently in the eighth spot in the West, one and a half games ahead of the Kings for the final playoff spot. And going to the playoffs would likely earn the Nuggets the right to be trampled by the Warriors in the first round. But just going to the playoffs would expose many viewers to Jokic’s diverse skill set, even if his team is wiped out of the playoffs in four games. Score one for the unicorns. That is a phrase you may not have expected to hear after the first three weeks of the season. On November 16th, the Wizards lost at home to the 76ers and fell to 2-8. People may not have been calling for Brooks’ job just yet, but things weren’t looking up in the nation’s capital, either. And then John Wall and Bradley Beal happened. Wall and Beal combine to average 45 points per game and both are having career years for a Washington team that currently sits in third in the Eastern Conference. Last year, the Wiz were one of the biggest disappointments in the NBA, an outcome that led to the firing of coach Randy Wittman and the hiring of Brooks. Four months into his tenure with Washington, it has become clear that Brooks is the right coach for this team, having gone 32-13 since that devastating loss to Philadelphia. Not only is Brooks the right coach for the Wizards, he’s the first-half Coach of the Year. Unfortunately, the asterisk must be addressed. The Utah Jazz are one of the most improved teams in the NBA this season; at their current pace, they would finish the season with 50 wins, a 10-win improvement over last season. But, as I was just saying, we need to take Utah’s success with a small grain of salt. Consider this: out of their first 57 games, Utah has played 22 of them against teams at .500 or above. In those 22 games, the Jazz are just 8-14. Included in that figure are two losses against the Los Angeles Clippers, the team’s most likely first-round opponent. Granted, the team has gone 27-8 against everyone else in the league, but these struggles are concerning. The fact that the Jazz have struggled against the league’s best teams could be explained in a number of ways; for example, the Western Conference has three of the league’s top four teams record-wise (Houston, Golden State, San Antonio) and Utah is not helped by playing these three teams a combined ten times this season. This also does not mean that I would want to play Utah in an early-round playoff series if I was in the West. The team has length to burn and Quin Snyder’s bunch also owns the league’s best points per game defense by nearly three points over the second-best team. I’m just pointing out that maybe the hype around their success is just slightly overblown. Earlier this week, the Magic finally conceded their disastrous season, trading forward Serge Ibaka to the Toronto Raptors for Terrence Ross and a first-round pick. The move had to be made, as any chance the Magic had of making the playoffs would have been as the seventh or eighth seed in the East. The move is likely good for both teams; Ibaka gives the Raptors some needed length and is a definite upgrade over Pascal Siakam at power forward. For the Magic, it starts Act II of the rebuilding process that began with trading Dwight Howard to the Lakers in 2012. So things aren’t going too well in Orlando. At least they still have Disney World, because their basketball franchise certainly is not a Magic Kingdom. Whether you like it or not, Russell Westbrook is having one of the greatest NBA seasons ever. That’s it. Even more impressively, Westbrook is single-handedly carrying the Thunder to a playoff berth and succeeding without very much help from his supporting cast. 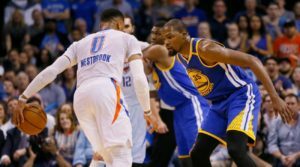 It is entirely possible that the Thunder would be in the position of the Los Angeles Lakers or Pheonix Suns if it were not for Westbrook’s heroics. Fun fact: the Thunder’s fifth-leading per game scorer this season is Josh Huestis, who averages exactly seven points per game. Do you want to know why he averages exactly seven points per game? Because he only played in one game this season. So kudos to Russell Westbrook, for being so great around so much, well, less-than-great. For that alone, he should be the league’s first-half MVP. Oh, and there’s that whole thing about doing something only one person has ever done before. Have any additional thoughts? Please leave them in the comments section!  You may not know this off the top of your head, but take a guess at the five longest active streaks of consecutive appearances in the NCAA Men’s Basketball Tournament. You probably got three teams right away (Duke, Kansas, Michigan State). The fourth, Wisconsin, might have been tougher for you, but you’re not necessarily surprised that the Badgers have made the dance for eighteen years running. But do you want to take a guess at the fifth team? Maybe you do, maybe you don’t. Either way, I’ll just give it to you: it’s the Bulldogs of Gonzaga. Yes; Gonzaga has made the tournament in each of the last 18 seasons. They’re going to make it 19 next month, but something feels different about this year’s Zags team. This year, the Cinderella label does not fit. This year, the Bulldogs are a legitimate national championship contender. This is arguably the best team coach Mark Few has ever presided over, as the Bulldogs currently sit at 27-0. Their success has catapulted them to national exposure and the #1 spot in the Associated Press poll for three weeks running. In the past, Gonzaga has been characterized as the little engine that could, the David to college basketball’s Goliath, etc. These characterizations are not true this year. This season, the Bulldogs boast one of the deepest, most talented teams in the country. Washington transfer Nigel Williams-Goss has paced the team in points, assists, and rebounds, leading or tying for the team lead in each of these categories. Williams-Goss has had such a successful season that he made the Midseason Wooden Award watch list in January. The Zags have one of the 25 best players in the country, and it appears very clear that Williams-Goss is one of the most talented players to pass through Spokane on this side of Adam Morrison. Williams-Goss is hardly carrying the load alone, though. A star has emerged in the frontcourt for the Zags, and it comes in the form of a man who looks less like a center and more like a right tackle. Standing at 7’1″ and 300 pounds, it would be easy to mistake Przemek Karnowski for literally anything other than a basketball player. But Karnowski is a basketball player alright, and a very good one at that. In fact, his progression and improvement from a season ago, as well as the arrival of Williams-Goss, are the two main reasons for Gonzaga’s success this season. Karnowski is making nearly 62% of his shots from the field and has upped his free throw percentage by 15 points from last season. Karnowski plays within his bounds; he cannot shoot threes and is not a great rim protector, either. But he knows what he is: a very skilled center, disguised as a mack truck, who can give many teams fits come time for the NCAA Tournament. There have been other contributors, as well. For example, 11 players have appeared in at least 20 games for the Zags this season, and 8 of those players average a minimum of 13 minutes per game; these figures underscore the excellent depth that Gonzaga has. Assuming injuries do not factor into the equation, the Bulldogs should have plenty enough depth to compete with the best teams in the land. 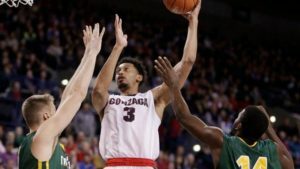 While bench contributors Killian Tillie and Bryan Alberts are both hampered by hand and ankle injuries, respectively, the Zags should be okay as their conference tournament will end a full nine, or possibly even ten, days before Gonzaga would play their first round NCAA tournament game. The time off will help them heal from injuries. In the moment, I agree, it seemed like an embarrassing upset. But hindsight paints a different picture because what we now know is that Wichita State was far from just a plucky little Missouri Valley Conference team. What we know now is that Wichita State went on to advance to the Final Four, where the Shockers played the eventual national champion (Louisville) closer than anybody else. Also: Wichita State had three future NBA players! It’s true: Wichita State advanced to the Final Four and was tied with the eventual national champions with three minutes to go in a national semifinal. It’s very fair to wonder if the Shockers would have won the national championship had they held on and defeated Louisville. Wichita State was a 9-seed when they defeated Gonzaga, but they turned out to be far better than their initial seeding. So it is very unfair to characterize that defeat as disappointing; if anything, it’s actually impressive that Gonzaga played the Shockers that closely. Now, the same overrated narratives are popping up again with the Bulldogs. However, if you look at the data, you will see that they are not overrated at all. In fact, the Zags are ranked #1 in both the Ken Pomeroy and the Jeff Sagarin ratings, and the fact that they are ranked first in two different but effective rating systems should show the country that Gonzaga is exactly where it should be as a potential #1 seed and the top team in the country. Another interesting stat: since the Pomeroy ratings started in 2002, no team has won a national championship without being in the top 25 in defensive efficiency. Gonzaga is ranked third in the nation in this category. They were ranked 30th in this category back in 2013, so their improvement defensively should be a clear sign that they can compete for a national championship. Few’s team also ranks third in the country in offensive efficiency; they can beat you in a number of ways, and their versatility should help them in the postseason. Quite frankly, Gonzaga shouldn’t need to prove that they are one of the best teams in the nation. After all, they beat Florida and Arizona, two teams that I view as national title contenders, before conference play began. The Zags have taken care of business on their way to a 27-0 record and a top ranking in most major polls. The Zags will be a force to be reckoned with come March, but many still believe they are overrated. These people are in for a rude awakening. So while the slipper still fits, Gonzaga doesn’t necessarily need to wear it this time around. This probably is not going to come as a shock to most of America (or the world), but the New York Knicks are a complete trainwreck. This organization is a different kind of trainwreck, though. They are the type of trainwreck that redefines the meaning of a trainwreck. The Knicks are a mess. The Browns and Jets are laughing at them. New Year’s Eve Mariah Carey thinks they are spinning out of control. Last night, though, was a new low, even by Knickerbocker standards. Last night, the Clippers came to New York and played the Knicks in a primetime, nationally-televised game. The Clippers have been struggling as well, having lost five out of their previous six games and having been without star point guard Chris Paul since January 16th. The potential was there for a less-than-stellar game, but what we got was much more than what we expected. Oakley was an integral part of the Knicks’ success in the 1990s, helping lead the team to the 1994 NBA Finals and several 50-win seasons in that time period. During his career, he played just as he behaved on Wednesday night; with an enforcer’s mentality and a reckless abandon. He once slapped Scottie Pippen and tried to end Charles Barkley’s life in a preseason game. The fact that he would get arrested at a Knicks game isn’t exactly a surprise, especially when you consider that he doesn’t have the best relationship with owner James Dolan. However, there have been two wildly different accounts of how everything went down last night at the Garden. 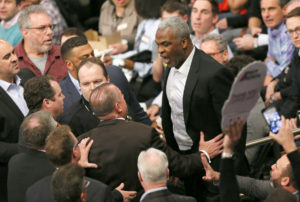 The Knicks organization contends that Oakley arrived at the game shortly after it started, almost immediately began hurling insults at Dolan (who was seated two rows down from Oakley), and was confronted by MSG security. Oakley, as could be seen on the ESPN broadcast, engaged in a physical altercation with the authorities and was arrested for three counts of assault and one for trespassing. Oakley, on the other hand, says that he never directed any comments toward Dolan during the game and was escorted out of the game by Garden security for no particular reason. Oakley also added that Garden security asked him why his seat was so close to Dolan’s, forcing Oakley to explain that he bought his own way into the game. The authorities persisted, and that is when the fight escalated. There are multiple witnesses who have backed up both stories, and the truth of what happened is likely somewhere in the middle between the two. The last line of the statement is my personal favorite: “He was a great Knick and we hope he gets some help soon.” There is a good deal of irony in that sentence. For example, just two years ago, Dolan received an email from a disgruntled, lifelong Knick fan about how badly the franchise was run. The fan, who at the time had rooted for the team for 60 years, ran through a laundry list of disgraces to the team and urged Dolan to sell the franchise. Dolan responded, suggesting that the fan was an “alcoholic” who was a “negative force” to anyone he came in contact with. But yes, Oakley is the one who needs help in this dispute. Disparaging those who have given years of service to the franchise, particularly through a statement on Twitter, is not a way to professionally run an organization. Oh, right, Knicks brass already did that just this past Tuesday. I mean, this franchise is the definition of dysfunctional. Jackson seemingly agreed with an article suggesting that Carmelo Anthony, the best player on the team, has not a care in the world for winning. Subtweeting the other half in a relationship is something you do right before a nasty breakup; Phil Jackson, unless he trades Melo, is stuck with him for another two years. I think his only strategy here is to make Anthony so angry that he waives his no-trade clause and agrees to play somewhere else. There is literally no way this relationship works unless that happens. Remember when Jackson was brought in as team president to be a steady presence and a beacon of stability for the franchise? Yeah, he’s actually been the opposite. Jackson’s leadership of the Knicks has left the team without much of a direction and, besides from Porzingis, not much of a future, either. Free agents don’t want to play for the Knicks and coaches don’t want to coach for the team, either. That’s spectacular. To an extent, I kind of feel bad for Hornacek; this could be his last opportunity to be an NBA head coach and he is not being allowed to function normally. At the same time, he probably knew exactly what he was getting into with the Knicks, so this probably shouldn’t be too much of a surprise to him, even as the season has gotten more and more out of hand. Speaking of out of hand, we will likely never know what really happened between James Dolan and Charles Oakley on Wednesday. What we do know is that the Knicks have definitively hit rock bottom…. for now.